Welcome to the State of Hockey, where each city has at least one rink and it’s not uncommon to see a toddler in skates before they can walk. The state high school tournament is our Super Bowl, and we’re proud to host it right here in the Capital City. The location is fitting as Saint Paul was integral in Minnesota’s establishment as the State of Hockey long before the Minnesota Wild started playing at the Xcel Energy Center in 2002. In fact, Saint Paul is known for developing the most extensive hockey program in the nation during the early twentieth century. Pre-1883: Ice polo, a mix between modern day field hockey and boot hockey, is played on the first outdoor lighted rink in Saint Paul. 1883: Ice hockey is introduced in Saint Paul by Ed Murphy, a former ice polo player who had observed hockey games in Canada. 1886: The first public games are played as a part of the Saint Paul Winter Carnival at the Aurora Arena (located at the intersection of Dale and University). 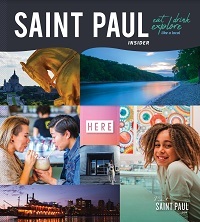 By the end of the year, several youth and adult teams are operating in Saint Paul. 1898: The St. Paul Hockey Club is formed. St. Paul AC and The Virginias are the most competitive teams in the league. 1899: The first Saint Paul high-school hockey game is played between Mechanic Arts and Central. The teams also competed against schools from Minneapolis. 1902: The Twin City Hockey League is formed, comprised of five Saint Paul teams and one Minneapolis team. 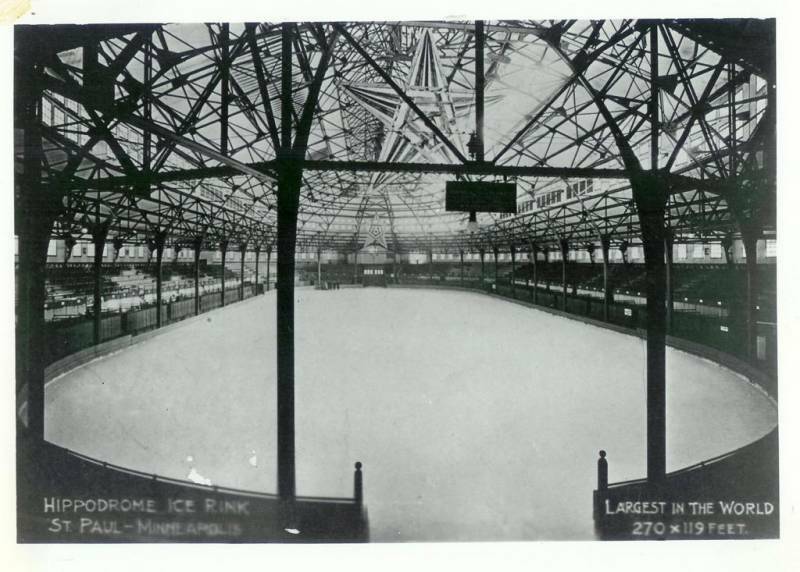 1906: The Saint Paul Hippodrome, located at the State Fair Grounds, is touted as the largest sheet of ice in the world at 119 by 270 feet. 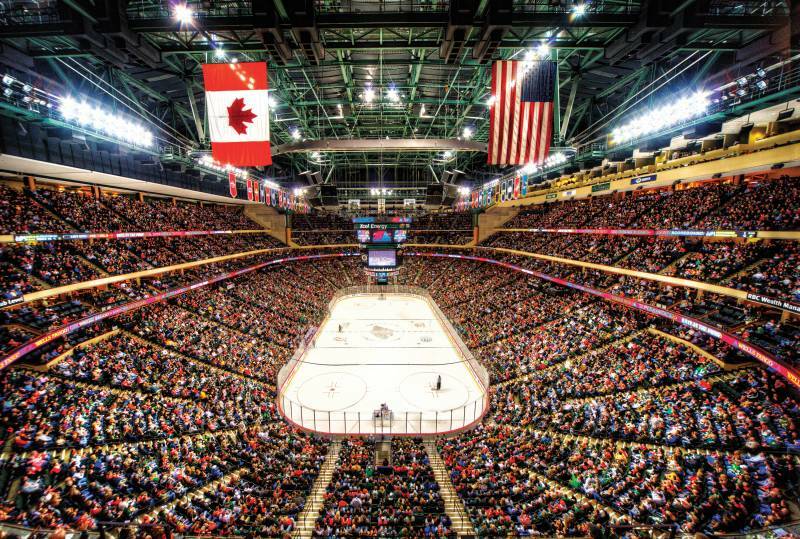 It is often considered the most storied building in Minnesota hockey history. 1913: The University of St. Thomas forms a collegiate team. 1914: The Twin City League is established as the first official high school league with most games being played on outdoor rinks. Mechanic Arts, Central, and Humboldt are consistently among the top teams in the conference. 1915: St. Paul AC joins the American Amateur Hockey Association (AAHA). 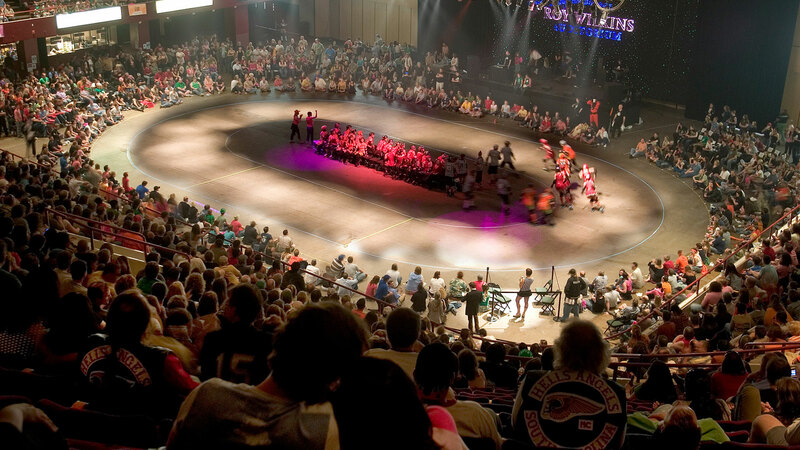 The team plays its games at the 1,700 capacity Coliseum Rink located on Lexington Avenue. 1917: The AAHA disbands due to World War I. 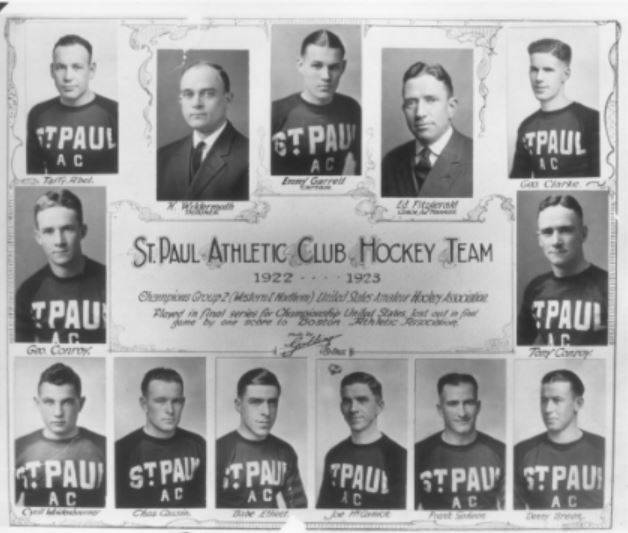 1920: St. Paul AC joins the newly formed United States Amateur Hockey Association (USAHA) and four Saint Paul players are named to the first-ever United States’ Olympic hockey team. They are Tony Conroy, Ed Fitzgerald, Frank “Moose” Goheen and Cy Weidenborner. 1925: The USAHA changes its name to the Central Hockey Association (CHA) as teams and players begin to leave the league to play professionally in the National Hockey League (NHL). 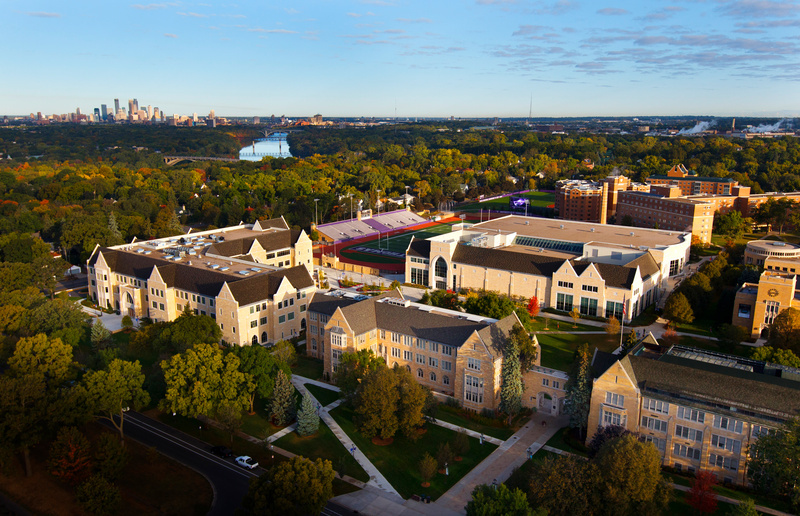 1926: St. Thomas, Hamline, and Macalester begin competing in the Minnesota Intercollegiate Athletic Conference (MIAC) against schools such as the University of Minnesota and St. Olaf. The CHA reforms into a professional league and changes its name to the American Hockey Association (AHA). The Saint Paul Saints are Minnesota’s first professional team, joining Minneapolis, Duluth, Winnipeg, and Chicago in the AHA. 1931: The Saint Paul Auditorium (now Roy Wilkins) opens with seating for 7,000 and artificial ice. 1945: The Minnesota State High School Hockey Tournament is held for the first time at the Saint Paul Auditorium, drawing 8,434 fans over three days. Eveleth claims the first title in a 4-3 win over Thief River Falls. 1951: The AHA (now known as the United States Hockey League) disbands, leaving no professional hockey in the state. 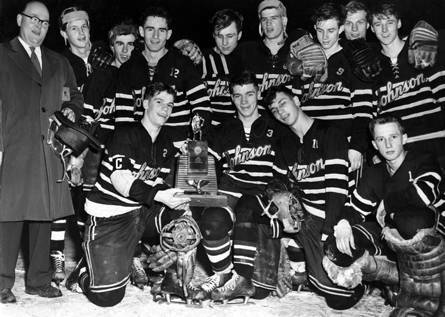 1955: Local hero Herb Brooks (back row, far right) helps lead Johnson High School to a state championship title. 1958: Saint Paul combines with Saskatoon to form a team that competes in the Western Hockey League for one season. 1959: St. Paul Saints join the International Hockey League (IHL). 1963: The St. Paul Rangers are founded as one of five original teams in the Central Professional Hockey League (CPHL). The team is the minor league affiliate of the NHL’s New York Rangers and plays at the St. Paul Auditorium. 1966: The St. Paul Rangers (now known as the Minnesota Rangers) move to Omaha, Nebraska. 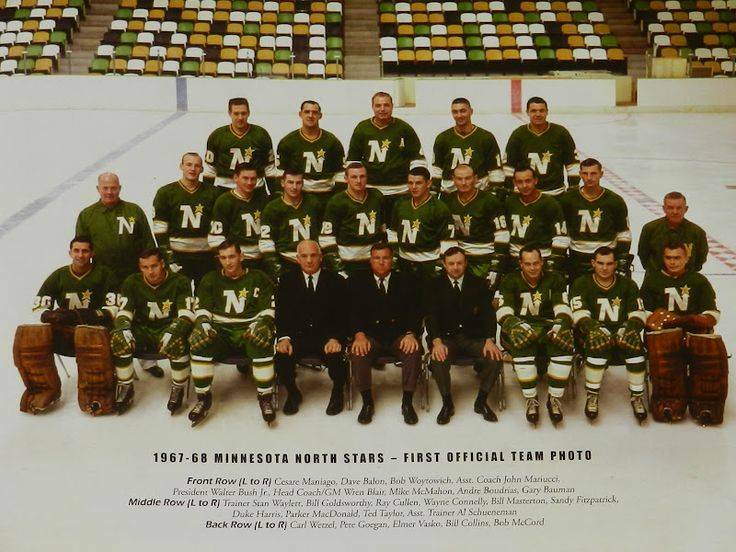 1967: Minnesota is awarded its first NHL Franchise, the Minnesota North Stars. They play at the Bloomington Met Center. 1969: The State High School Hockey Tournament moves from St. Paul to the Met Center in Bloomington. 1971: The Minnesota Fighting Saints are founded to play in the World Hockey Association (WHA). The St. Paul Auditorium is their home arena. 1973: The St. Paul Vulcans form to play in the Midwest Junior Hockey League (MJHL), a league formed to give visibility to players who were not recruited to play college hockey out of high school. The Vulcans became known as the "Gophers Hockey farm team" by hockey insiders as the University of Minnesota recruited heavily from the Vulcans. 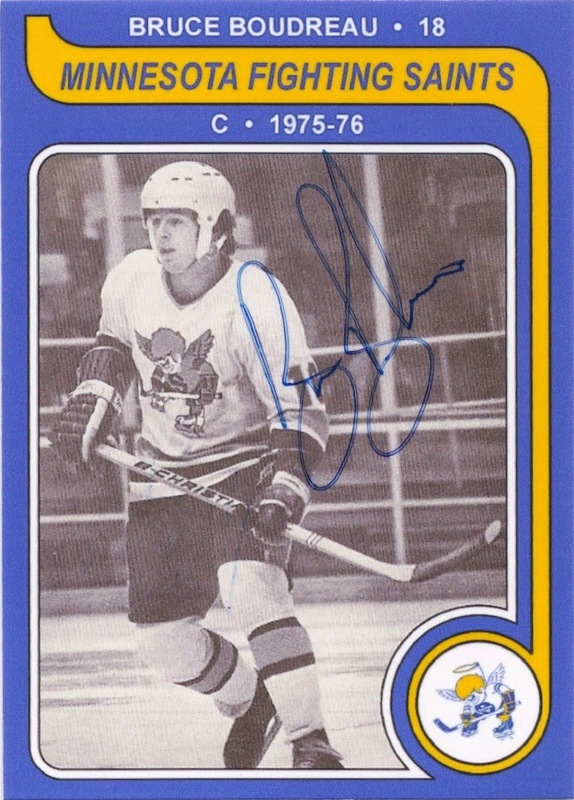 1975: Current Minnesota Wild head coach, Bruce Boudreau, plays one season for the Fighting Saints. 1976: The State High School Hockey Tournament moves from Bloomington to the St. Paul Civic Center (now Xcel Energy Center). 1977: The Fighting Saints withdraw from the WHL for financial reasons. 1979: The Civic Center draws a record crowd of 101,000 for the three-day, eight-team State High School Hockey Tournament. 1980: Saint Paul native Herb Brooks and the U.S. Olympic team shock the world by winning gold in Lake Placid. 1993: The Minnesota North Stars move to Dallas. 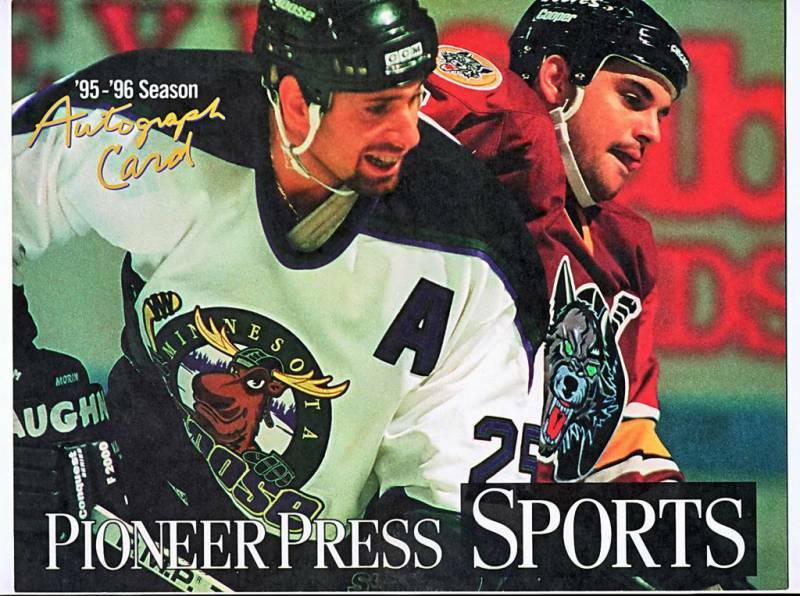 1994: In the absence of professional hockey, the Minnesota Moose are formed to play in the IHL. The name is chosen through a St. Paul Pioneer Press “name-the-team” contest. The Moose play at the Saint Paul Civic Center. 1996: The Minnesota Moose move to Winnipeg to play in the American Hockey League (AHL). 2000: The NHL awards Minnesota an expansion franchise and professional hockey returns to the state for the first time in seven years. It is announced that the Minnesota Wild will play at the new Xcel Energy Center, built on the site of the former St. Paul Civic Center. The St. Paul Vulcans (now the Twin Cities Vulcans) move to Nebraska. 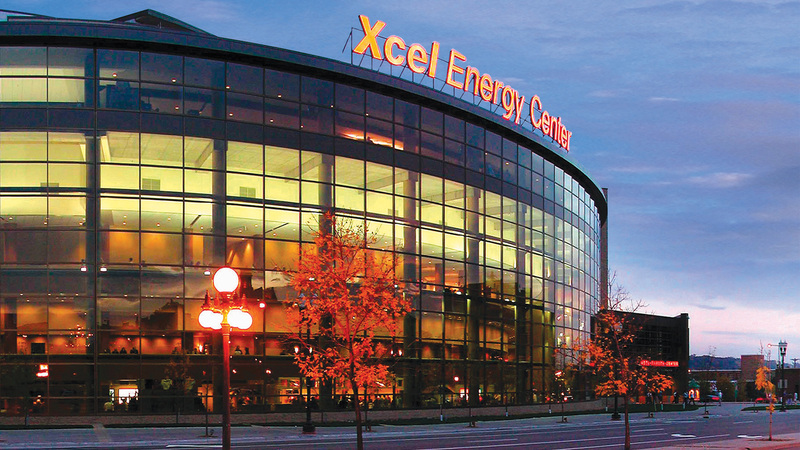 2002: Xcel Energy Center hosts the Frozen Four. The University of Minnesota defeats Maine in front of the home crowd, winning their first NCAA title since 1979. 2003: In their first playoff appearance, the Minnesota Wild make a run to the Western Conference Finals. 2004: NHL All-Star Weekend is held at Xcel Energy Center. 2008: The Minnesota Wild win their first division championship. 2011: Xcel Energy Center hosts the 2011 NHL Entry Draft. The Frozen Four returns to Saint Paul for the second time. 2012: The Minnesota Wild make franchise history by signing the NHL's top two free agents, Zach Parise and Ryan Suter, to matching 13-year contracts. 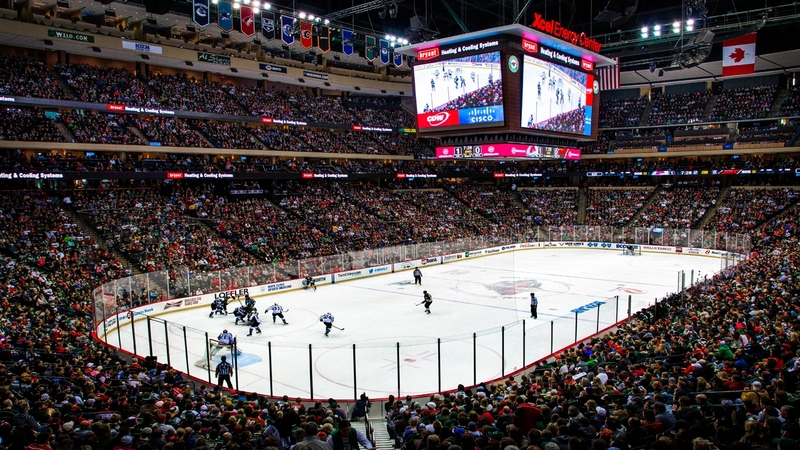 2016: A record 32,585 fans attend the 2016 Boy’s State High School Hockey Tournament Class AA semifinal round at the Xcel Energy Center. In terms of viewing and attendance, the tournament is largest state sports tournament in the country—beating the Texas and Florida High School Football Tournaments and the Indiana High School Basketball Tournament. 2018: Tria Rink opens in downtown's Treasure Island Center. The rink serves as the practice facility for the Minnesota Wild and home rink for the Minnesota Whitecaps—the state's professional women's team was officially admitted to the National Women's Hockey League (NWHL) in May of 2018. What's your favorite Saint Paul hockey moment? Share it with us on Facebook, Instagram or Twitter! For more information on Saint Paul (and Minnesota's) hockey history, visit VintageMinnesotaHockey.com.